The Apollobet company starts in 2009 under the jurisdiction of Isle of Man – Great Britain. However, at the moment the company operates under BoyleSports registered in Gibraltar. The company is licensed and regulated by the government of Gibraltar. The license number RGL 083 &084 is for all customers that are not from Great Britain. However, the gambling commission granted the company with license number 000—39469-R-319383-001 specifically for customers in GB. The company is old and well respected, so it has thousands of clients and thanks to the high odds and high levels of security, people from all over the world use the website bet. However, the online bookie has many things to improve and it surely can develop further to become one of the leading sports betting provider. Any traditional and recreational sports gamblers can make Apollobet their fine choice for a trustworthy partner in the world of online gambling and entertainment. Since 2016 Apollobet closed down their betting services. The bookie offers bets on many and different sports and games. Some are American football, baseball, football, golf, rugby, boxing and many others. The total number is over 15. Alongside the big number of sports on which people can bet, the online bookmaker offers casino games that include table games, hot slots, roulette, and blackjack. Some of the games to pick from are jackpot Cherries and Wilds Safari. Apollobet offers to bet on politic and entertainment as well. Live betting is an option for the bettors decided to go for with the bookie. Live streaming isn’t available, but statistics and detailed information about the event are. On top of that, every client can download an app on his/her mobile device. This eases the betting process immensely and provides the bookie with important information used later for the improvement of the main service. The website of Apollobet is very well structured and offers all the needed information. Therefore, you can find three different systems for odds calculation – decimal, fractional and American. To ease clients even further, there is a bet calculator that takes everything into account and allows the client actually to find out easier what sort of money can he/she win. As it covers many sports the variety of odds isn’t that huge. However, the bookie offers handicaps, home/away draw bets, in-play bets, etc. The betting margin for football is around 6.3%, for tennis 5.8%. The minimum amount of money to bet is 0.1 EUR, and there isn’t a roof for maximum. The maximum winning for a day can be 50 000 EUR. Match betting, draw no bet, both teams to score, bot team to score and match result, Match result, and total goals, Not to win, double chance. Also half time/full time, winning margin, handicaps, total goals, correct score, first half, time to goal and many other markets. Being so popular and covering so many different betting options and a huge number of clients is quite demanding. That is why the people from Apollobet are o into security. 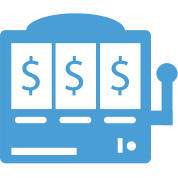 The offer full visit history, so the client will be able to see when and from where your account have been open, check deposits and withdraws, gaming providers, etc. The website itself has high levels of security as well as all card numbers, passwords and account details are automatically coded and saved on well-protected servers using firewall and SSL. And to enhance that even further, the website is said to run constant anti-fraud checks. Each client can communicate with the company via phone, email, live chat and by sending mail to the address. The main language on the website is English, and this is how every client can communicate with the support team. The website works with many different currencies and payment methods, which can be reviewed easily in the table. The deposit options must be only in one currency as the withdraws later will be in the same currency picked at the beginning. Withdraws options include exactly the same payment methods. It is important to know that different payment options take different time for the transfer. Usually when a money transfer by using a card is instant and is less costly where using cheque or bank transfers takes more time and may be more expensive, depending on the prices bank in particular. Like many other big online sports bookies, Apollobet offers different types of promotions and bonuses. For every client who opens an account, there is 50 GBP/EUR bonus. When betting on horse races and the horse fails to start, the bookie will return the bet. 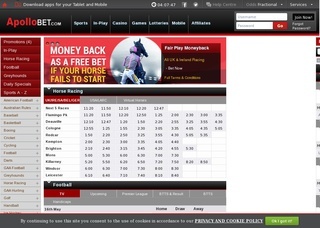 The company guarantees best odds on all UK and Irish horse races and dog races. Specific bonuses for a particular sporting event are also quite often seen as well as bonuses based on the performance of a particular athlete. 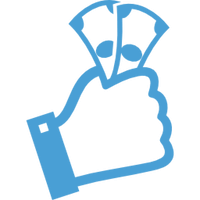 For instance, some clients get the bonus if the specific player scores in a particular match. Apollobet offers 10 EUR/GBP welcome bonus for their casino that are risk-free money.